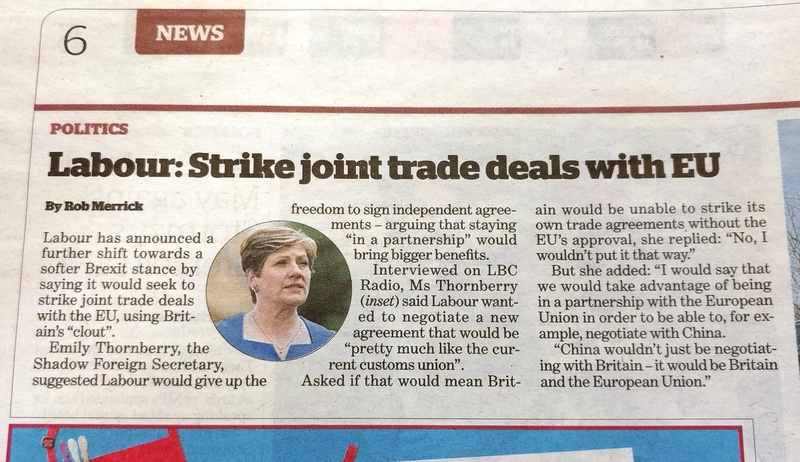 Below is a cutting from Friday’s ‘I’ newspaper and the big question is, what on earth is Emily Thornberry on about? We don’t have to leave the Customs Union at all and frankly it seems utter nonsense to do so. 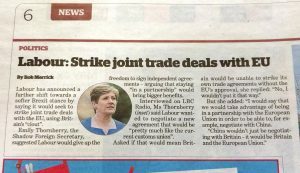 On that basis why is Labour’s policy seemingly (and I say seemingly as nothing is clear with Labour – or the Tories for that matter – when it comes to Brexit) to leave it and then try to re-negotiate something pretty much the same! Why oh why can’t Labour do their job as the Official Opposition and try opposing the Tories over Brexit for once? It seems however that they want a hard Brexit to go through, despite knowing that it will make the poor poorer for example, all so that they can sit back and try to claim it was the Tories fault. What a mad position for a supposedly progressive party of the left to hold when Labour could make sure that our minority Tory Government is defeated by working with the SNP, Greens, Lib Dems and Welsh Nationalists.